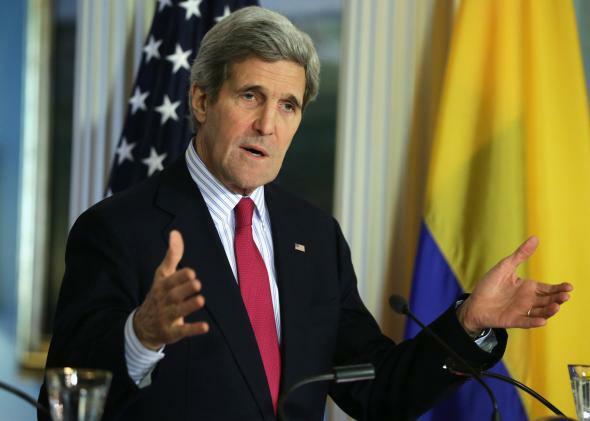 Kerry, Russia, and the Ukraine invasion: Let's hear it for nuance and diplomacy. Is Kerry Right About Ukraine? John Kerry. On the one hand … on the other hand. I was against John Kerry before I was for him. But sometimes, nuance is just what you need. The invasion of Ukraine—is it really an invasion?—might be one of those times. We don’t want this to be a larger confrontation. … What we want is for Russia to work with us, with Ukraine. If they have legitimate concerns, George, about Russian-speaking people in Ukraine, there are plenty of ways to deal with that without invading the country. They have the ability to work with the government. They could work with us. They could work with the U.N. They could call for observers to be put in the country. The invasion of Crimea has already happened. That’s absolutely accurate. And we believe that President Putin should make the decision to roll it back, and we will continue to press for that, as well as for his legitimate engagement with the current government of Ukraine in order to avoid further increase in the tension in the Crimea. We understand that Russia has interests in Crimea. The Ukraine government is prepared to respect the base agreement. Nobody threatened those Russia interests. And we are prepared to stand up against any hooligans, any thuggery, any individual efforts with Russians, in order to create stability in Ukraine and allow the people of Ukraine to make their choices for the future. … This is a time for diplomacy, and we will engage diplomatically as much as we can in order to steer this away from the increase in the tension of the level of the crisis. Nobody wants this to spiral into a bad or worse direction. The disciplinarian in me—the guy who endorsed the invasion of Iraq—finds this mealy-mouthed obsequiousness exasperating. It seems there’s no limit to the world’s tolerance for appeasement. But when I read about what’s actually going on in Ukraine (including these useful pieces by Josh Keating and Fred Kaplan), I see merit in Kerry’s delicacy. So far, it is an invasion of Crimea, not the whole country. Crimea is different, with stronger Russian claims and interests. Russia has limited its aggression, by avoiding bloodshed and using uniforms without badges. If this were a home invasion, and you were a cop arriving on the scene, it would matter a great deal to you whether the perpetrator had harmed anyone in the house. If he hadn’t, you would take that as a sign that he might not want violence. You would emphasize to him that he hadn’t yet crossed that line. You would encourage him to put down his weapons and come out. As bad as what Putin, you know, has been doing may be, he hasn’t killed people. And I think he’s trying to show force in a way that gets a specific task done: He wants his base … On top of that, we do have a pretty strong set of potential economic sanctions … So if this really escalates to a very bad kind of thing—which it hasn’t yet—but if it got into civil warfare and an invasion by Russia to back up one side in Ukraine, then I think these kinds of tools would be applied, and they’d be applied effectively, and Putin knows it. So I’m relatively confident he won’t go there. I don’t think this is a moment to be proclaiming one thing or the other. We’ve had difficulties with Russia with respect to certain issues. And even as we’ve had—we’ve managed to do the START treaty. They’ve cooperated on Afghanistan. They’ve cooperated on Iran. So this is not a zero-sum, dead/alive. It’s a question of differences, very profound differences on certain issues and certain approaches. Infuriating as Putin is, and disgusted as I am at yet another Russian invasion, I have to acknowledge the truth of Kerry’s words. Hitting the off switch on U.S.-Russian relations would be as rash as hitting the reset button. What we need now is a precise understanding of what Putin has done, what he hasn’t done, and how he can be steered in the right direction. Kerry might be the guy for this job.